It’s no secret that plumbing can be hard work, but it is also rewarding and uniquely challenging, and can be an ideal lifelong career with the right company. 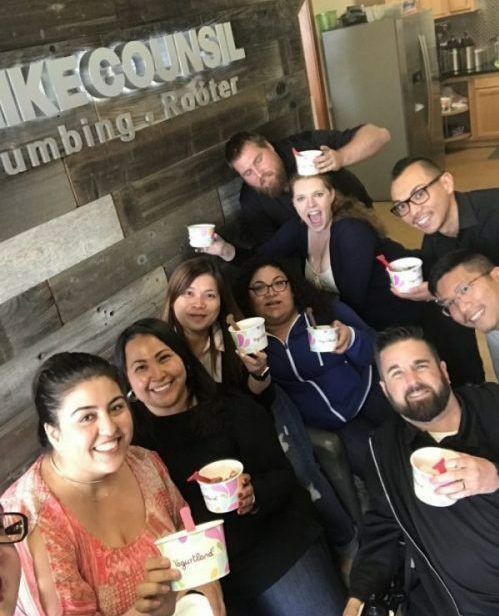 At Mike Counsil Plumbing, we embrace the challenges that can come in the industry; we strive to continue growing and evolving to operate more efficiently with modern technology while providing our customers with the exceptional service they expect in San Jose and the Bay Area. We’ve spent more than 20 years creating our company culture, and it’s what attracts the most talented and driven individuals to come work for us and help maintain our reputation as a plumbing leader in the region. Mike Counsil Plumbing opened in 1994, and we started out as a mom and pop business. Though we’ve grown substantially over the years, we are still family-owned, and we strive to treat every member of our staff like a part of the family. We also want our employees to have a work-life balance, so they can enjoy time with their own loved ones outside the work environment. Extensive Daily Training – The foundation of providing exemplary service to our wonderful clients comes from both our daily classroom training and hands on technical training. We develop our people from the ground up to ensures positive character ethics and the necessary mechanical knowledge to offer premium service. Our trainings include: relationship building & people skills, technical/mechanical training and career developmental training. Our robust culture of training offers our team members an accelerated path to their ultimate dream career. Loyalty Trip Bonus – Time off is an important consideration when deciding where to work, and our team enjoys ample time off as well as a loyalty trip bonus after five years with the company. We’ll pay for a trip so that our employees can make the most of their vacation time as our way of saying thanks for continuing to work with us. Special Event Celebrations – Birthdays and holidays don’t go unnoticed around our headquarters. We have birthday lunches and special celebrations for the holidays to make everyone feel special and included on these important occasions. Offsite Events – To further enhance employee morale and build stronger bonds with our team, we host two offsite events annually where fun is the focus. At Mike Counsil Plumbing, we believe in treating our staff well to encourage the best work possible, which keeps our clients happy and coming back. With this effort, we become more profitable and reputable, allowing each employee to continue growing his or her career with us.